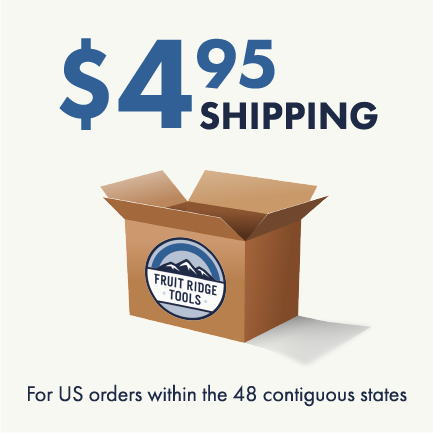 Fruit Ridge Tools LLC is required to collect sales tax in all states where we have a physical presence, which currently is New York and Pennsylvania. If you are a tax exempt customer, please place your order on our website first. Your order will show that you are being charged tax, this amount will be refunded back using the original payment method on the next business day. Please email us a valid and up-to-date signed copy of your tax exempt form to sales@fruitridgetools.com with your order number or fax to 815-642-4489. Once we receive the form(s) we can refund the sales tax once the payment has been cleared. We need the actual signed form, we are not able to accept just the form number as a note on the order. If you have submitted a tax exempt form previously that is up to date, please let us know that we have a copy on file, there is no need to submit a form for each order.